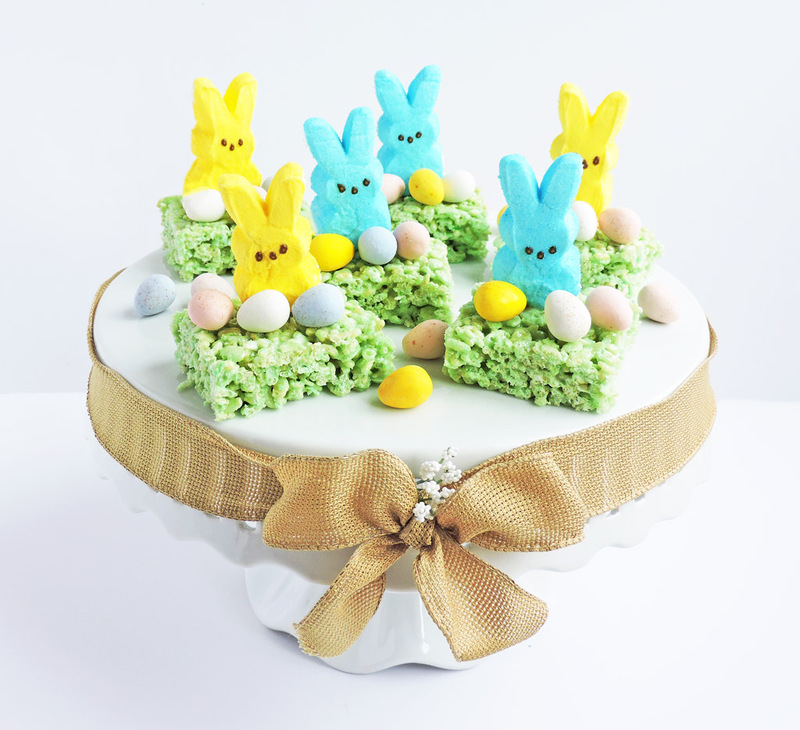 Spring has sprung, so that means it’s time for these Easy Easter Bunny Treats! 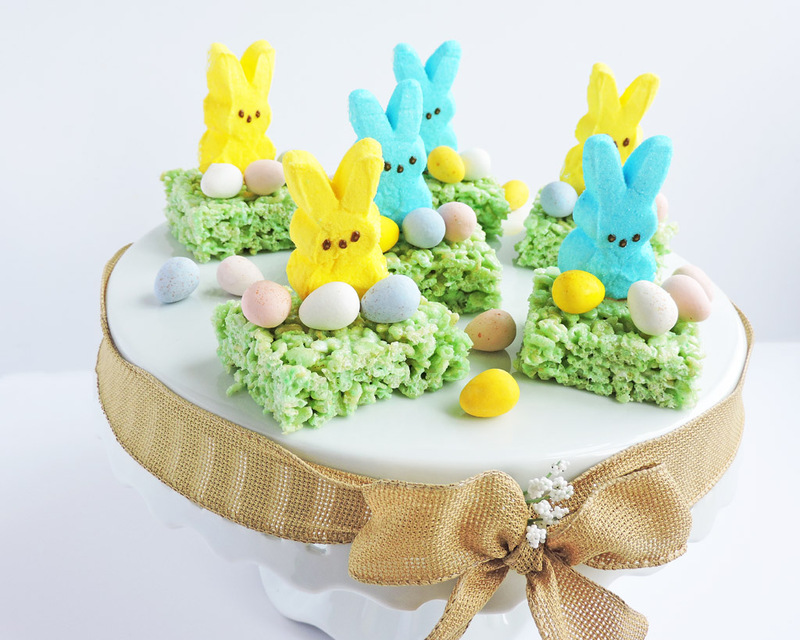 These treats are fun to make with the kiddies and make great Easter basket stuffers! Easter is almost here! Are you busy buying those new outfits and making Easter baskets….er, I mean waiting on the Easter Bunny to drop off those Easter baskets?? Lol! Things have been pretty hectic around our house; more than usual! We’ve been celebrating National Nutrition Month, testing several new recipes, and trying to find the time to do fun Easter activities with the kids! Even though my schedule has been a little crazy, I still found some time to make these fun Easy Easter Bunny Treats with my boys! They love rice cereal treats, so I wanted to put a fun spin on them! When it comes to holiday treats, I allow my kids to enjoy them in moderation! Just because I’m a Registered Dietitian Nutritionist, doesn’t mean that I do not allow my kids to have a few of their favorite treats. It’s all about balance! My kids are obsessed with the Easter Bunny and Easter eggs! They play with those plastic Easter eggs all year round, and I always find them behind the furniture, in their closets, underneath their beds, etc…lol! I thought it would be fun to incorporate their favorite things into these treats! 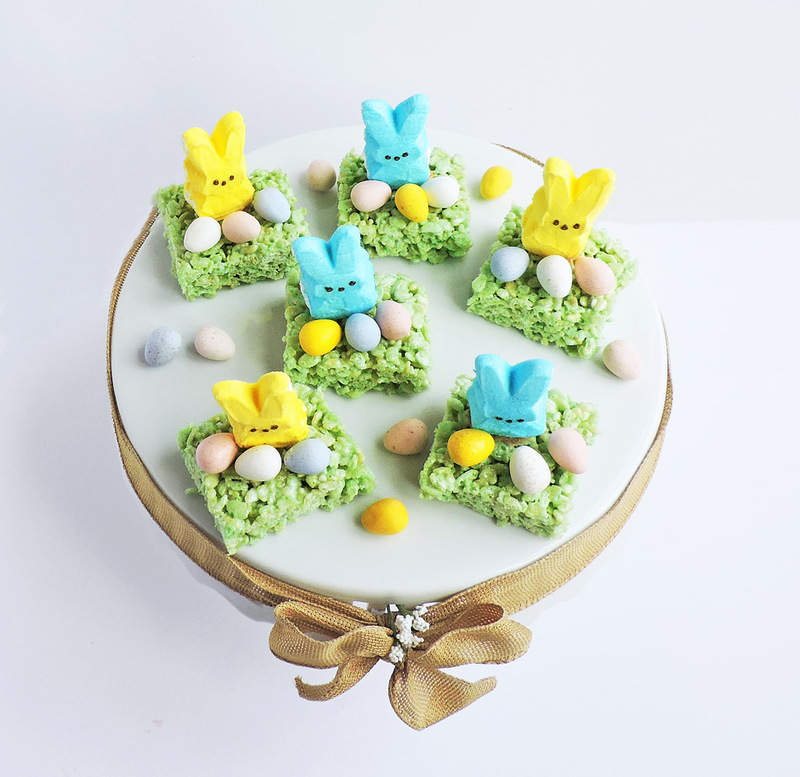 To make these Easy Easter Bunny Treats, I simply followed the basic rice cereal treats recipe and added a few green drops of green food coloring to the mixture to make it resemble the color of grass! I placed the treats in the fridge to set. Once they were firm, I cut them into squares and placed a marshmallow bunny on top. If the bunnies have trouble staying up, just add a little peanut butter to the bottom and place it on the treats! Add a few chocolate eggs around the bunny and you’re done! I wanted these treats to resemble bunnies hoping in the grass! I think I nailed it! ? 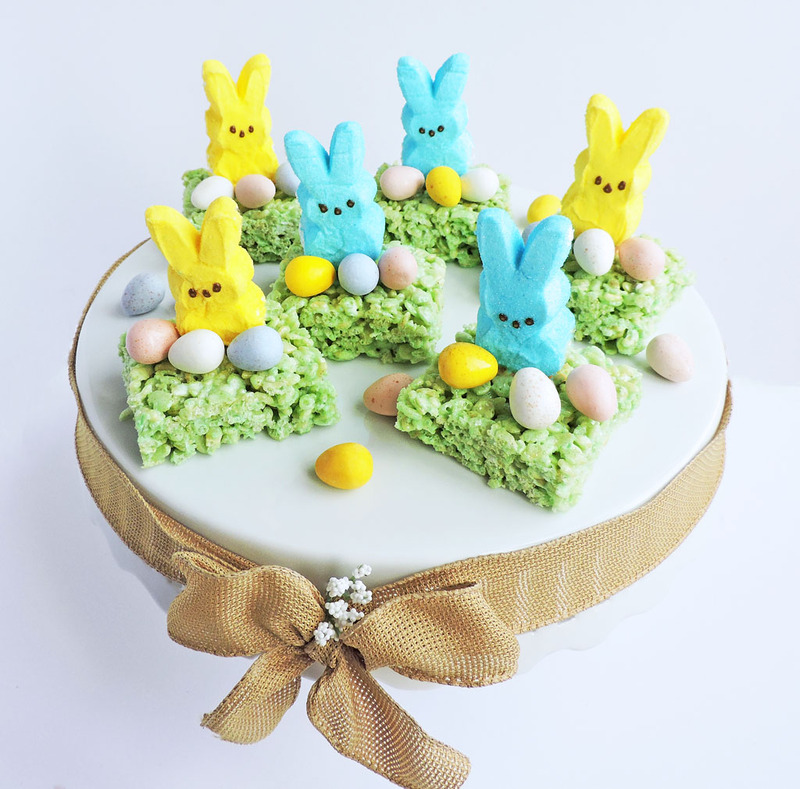 For more Easter recipes and décor inspiration, check out my Easter Pinterest Board! In a microwave-safe bowl, heat butter and marshmallows on HIGH for 3 minutes, stirring after 2 minutes. Stir until smooth. Add about 6 drops of green food coloring, or until desired color is reached. Using buttered spatula press mixture into 13 x 9 x 2-inch pan coated with cooking spray. Place in refrigerator to cool. Cut into 2-inch squares. 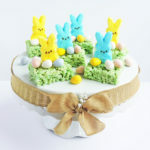 Place a marshmallow bunny and a few miniature eggs on top of each treat. If the bunnies fall over, put a little peanut butter on the bottom of each bunny and adhere it to each treat.